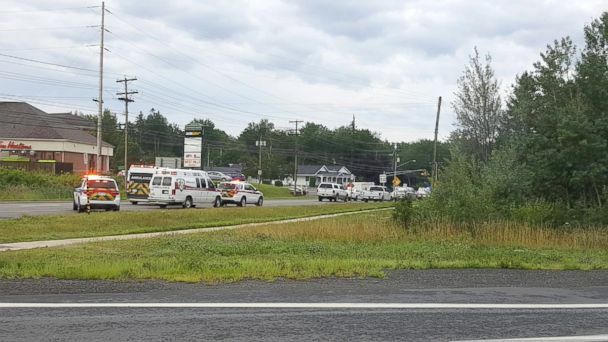 Four people were killed in a shooting in Canada's eastern city of Fredericton on Friday morning, police said. The suspect was wounded during the incident and is in custody. Police officers were responding to reports of gunshots at an apartment building in Fredericton, the capital of New Brunswick province, when they encountered and fired at the suspect. The Fredericton Police Force urged residents via Twitter to avoid the area and "stay in their homes with doors locked." The police force also asked the public not to report on the locations or activities of authorities and first responders. Around 9:30 a.m. local time, officers forced entry into an apartment unit and arrested a 48-year-old man. The Fredericton Police Force subsequently declared via Twitter that there was "no further threat to the public." The suspect was transported to a local hospital for "serious injuries" related to the incident, police said. Two officers from the Fredericton Police Force were among those killed Friday: Lawrence Robert Costello and Sara Mae Helen Burns. Costello, 45, was a 20-year veteran of the police force and he leaves behind his partner and four children. Burns, 43, had been with the force for two years and leaves behind her husband and three children. "It's been a very difficult day," Fredericton Police Chief Leanne Fitch told reporters Friday afternoon. "Those that were killed this morning were taken very good care of." Two civilians, an adult male and an adult female, were also killed. Authorities are waiting for family members to be notified before releasing their names. The circumstances of the shooting were unclear and authorities declined to provide further details at a press conference Friday afternoon. The investigation is ongoing. Canadian Prime Minister Justin Trudeau issued a statement on the shooting, praising first responders and mourning the slain officers in Fredericton. "There is no greater gesture than to put oneself in harm's way to protect the life of another," Trudeau said. "This morning, first responders rushed to the scene of danger. They did not think twice about what they had to do to keep their fellow Canadians safe. They were unflinching in their duty. We will not forget the two fallen police officers whose sacrifice no doubt saved lives and prevented even greater tragedy."